Community Harvest of Davis (formerly Village Harvest Davis) is a 501(c)3 nonprofit organization, run entirely by volunteers, that harvests fruit from residential trees and donates it to agencies that feed people in need. Donations are tax deductible. 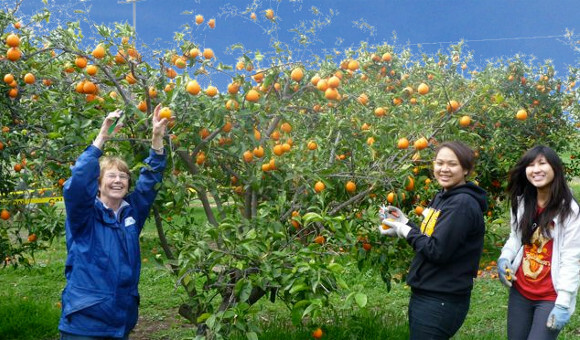 We harvest in Davis and donate fruit to Davis agencies, primarily STEAC (Short Term Emergency Aid Committee), with any excess going to the Food Bank of Yolo County and to local churches. Our mission is to provide food for people who need it, promote sustainable use of urban resources, and contribute to a stronger community. As of September 2017, we have harvested and donated over one-quarter of a million pounds of fruit. There are over 200 homes in Davis in our database and over 400 volunteers including members of 11 UCD service groups.